I simply cannot believe we are pretty much half way through June already. At this rate summer will be over in the blink of am eye. But how lovely it is that summer is actually here. June has had it's stressful moments - mainly thanks to my two year. He was ill, had a trip to the minor injuries unit (thankfully neither of these were serious) and has just been testing our patience a bit with some "terrible twos" behaviour. But I am trying to ignore the stresses and enjoy what is probably my favourite season. A bit of warmth and sunshine always makes me smile. This photo makes me smile too. 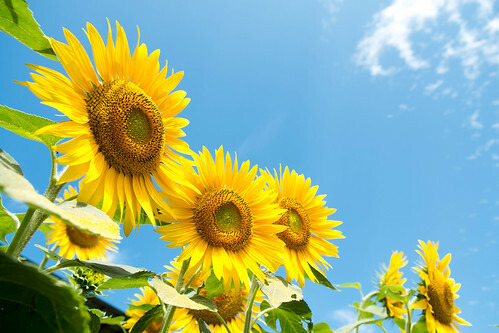 I love the contrast of the bright yellow sunflowers against that fabulous blue sky. And I really like the angle at which this was taken. It makes me wonder if these are really tall sunflowers or whether this was taken from very low down. I hope your summer had started well. Long may the sunshine and blue skies continue!